One of the most useful collecting techniques for those interested in longhorned beetles (families Cerambycidae and Disteniidae) is fermenting bait traps. I was first clued into the use of such traps soon after I began collecting these beetles in the early 1980s and encountered a series of rather old publications by A. B. Champlain and S. W. Frost detailing their usefulness and the diversity of species found to be attracted to them. Champlain & Kirk (1926) listed 15 species of Cerambycidae attracted to bait pans containing a mixture of molasses and water. This list was expanded to 37 species by Champlain & Knull (1932), who noted that a mixture of one part molasses to ten parts water in a gallon-pail seemed to give the best results. Frost & Dietrich (1929) listed 20 species captured with a mixture of one part molasses to 20 parts water. Twelve of the species they mentioned were not listed by Champlain & Knull (1932), and the list of Frost (1937) included two additional previously unrecorded species. I made extensive use of fermenting bait traps during my 1980s survey of longhorned beetles in Missouri (MacRae 1994) using a mixture of one part molasses, one part beer, nine parts tap water, and a sprinkling of dry active yeast to start fermentation. This recipe was based on that of Champlain & Knull (1932) (although I must confess that I do not remember where I got the idea to add beer and yeast). 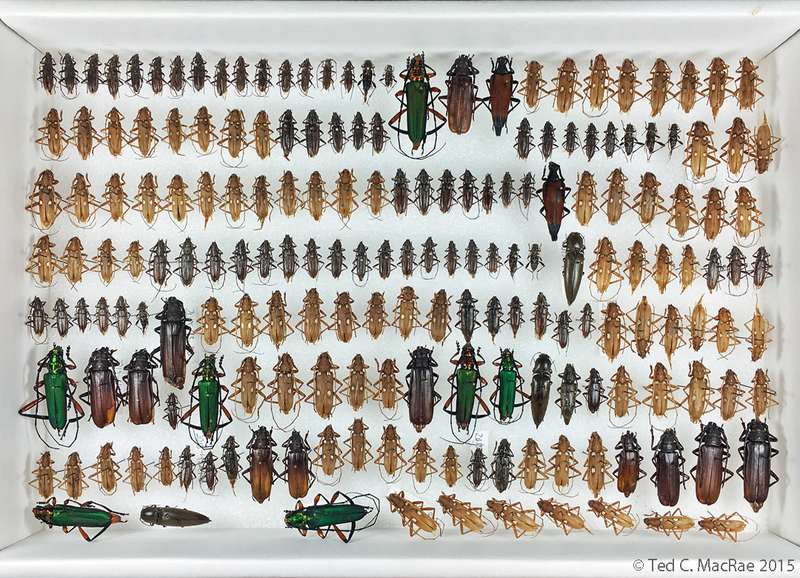 During that study, I collected 13 species of longhorned beetles using this method and found in other collections specimens of three additional species also collected with fermenting baits. Of the species I collected, the most significant was a large, attractive Purpuricenus that closely resembled P. axillaris (which was also collected in the traps) but clearly was not that species. These eventually proved to be undescribed after I was able to examine type material in the Museum of Comparative Zoology at Harvard University, leading to a review of the genus in North America and the description of the new species as P. paraxillaris (MacRae 2000). Since then I’ve employed fermenting bait traps to collect Cerambycidae in other parts of the country (MacRae & Rice 2007), and I now have records of 72 species of U.S. Cerambycidae documented as being attracted to fermenting baits. My interest in this technique was renewed some years ago when I finally succeeded in collecting the spectacular Plinthocoelium suaveolens in fermenting bait traps placed on glades in extreme southwestern Missouri. During my Missouri survey, I had done the bulk of my bait trapping along the edges of glades just south of St. Louis in Jefferson County, and while I had a record of this species in those glades I had never collected it there myself. Finally, last year I observed one of the host trees (gum bumelia, Sideroxylon lanuginosum) on these glades with the characteristic P. suaveolens larval frass pile at the base of the trunk, prompting a renewed effort this past season to collect the species there using fermenting bait traps. In early June I placed a series of traps at Valley View Glades Natural Area (~4 miles NW of Hillsboro) and Victoria Glades Natural Area (~2.5 miles S of Hillsboro). At both locations four traps were placed along the upwind interface between dry, post oak woodland and dolomite glades. Traps were spaced about 50–100 yards apart and hung to ensure exposure to sunlight but minimize the chance they would be discovered by vandals. Each trap consisted of a 2-L plastic bucket with a small hole drilled near the rim on each side and a length of wire attached to allow hanging from a nail in the side of a tree. Two baits were used: 1) molasses/beer, and 2) red wine. The molasses/beer recipe was based on Guarnieri (2009)—more concentrated that what I have used previously, and was prepared by combining a 12-oz (355 mL) jar of dark molasses with an approximately equal volume of tap water in a 1-L plastic bottle, agitating thoroughly, and bringing to one liter volume with tap water. At the trap site, about 500 mL of diluted molasses was added to the trap, followed by a 12-oz can/bottle of beer and one-half of a 7-g packet of dry, active yeast. Red wine bait was a cheap jug variety, undiluted, with about 500 mL added to the trap. Molasses/beer and red wine were alternated in the traps at each location and replaced every two weeks or if excessively diluted by rain or evaporated during hot, dry conditions. Traps were checked weekly from early June to mid-September by pouring the trap contents through a kitchen strainer over an empty bucket and transferring beetles with forceps to empty vials. Once back at the vehicle, tap water was added to each vial and the vial agitated to rinse the specimens and remove bait residue. The water was decanted and the beetles blot-dried with paper towels before transfer to clean vials containing tissue and ethyl acetate to halt decay and maintain the beetles in a relaxed state for pinning. A charismatic trio of Cerambycidae from fermenting bait traps at Victoria Glades: Purpuricenus paraxillaris (left), Plinthocoelium suaveolens (center), and Stenelytrana emarginata (right). A note about my preferred trap design. I have always used open-top buckets (previously 1-G metal, now 2-L plastic), but “window jugs” (i.e., ½-G milk or juice jugs with holes, or “windows”, cut in the sides) are also commonly used. I have not directly compared buckets with window jugs; however, I favor buckets because I believe beetles attracted to window jugs are more likely to “perch” on the trap itself rather than fall directly into the bait. I also believe that beetles, once trapped, are more likely to escape from window jugs because the window edges provide “grab” sites for beetles before they succumb. The risk of escape can be reduced if the bait surface lies well below the bottom edge of the windows, but this then limits the quantity of bait that can be used. In my experience, 500–750 mL is the minimum volume of bait that is needed to last the duration of the two-week fermentation cycle without evaporating to the point that it is not deep enough to quickly submerge beetles falling into it. Some may be concerned that open-top buckets are prone to dilution by rain, but in my experience this happens infrequently and I have not noticed diluted bait to be any less effective at attracting beetles. Rain shields, on the other hand, only serve to provide a potential perch for beetles attracted to the trap. Plinthocoelium suaveolens captured in flight near its host tree, gum bumelia (Sideroxylon lanuginosum), at Victoria Glades. A total of 558 longhorned beetles representing 16 species were collected from the traps over the course of the season (see list below). 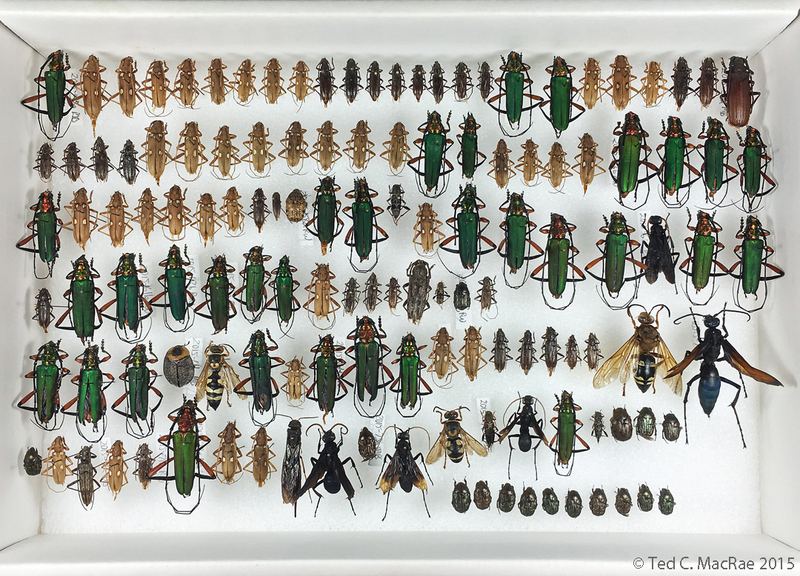 Of these, 339 specimens representing 14 species were attracted to molasses/beer, while 219 specimens representing 14 species were attracted to red wine. Ten species were represented by more than two specimens and were attracted to both bait types, the most desirable being Plinthocoelium suaveolens (41 specimens), Purpuricenus axillaris (20 specimens), P. paraxillaris (3 specimens), and Stenelytrana emarginata (6 specimens). The number of P. suaveolens collected is remarkable, considering that it was not collected during my previous trapping effort spanning several years in the 1980s. It may be significant that 1) the molasses/beer recipe used in this study was considerably more concentrated than that used in the 1980s, and 2) nearly twice as many specimens were collected in red wine (not used in the 1980s) compared to molasses/beer. I routinely examined the gum bumelia trees during my weekly visits in an attempt to find adults on their host, especially during flowering, but encountered only a single adult in flight near one of the trees—a curious result given the diurnal habits and large, conspicuous appearance of the adults. All other species collected in numbers were more attracted to molasses/beer, with the significant exception of Purpuricenus paraxillaris. Seven species taken this season were not detected with fermenting bait traps in the 1980s, bringing to 23 the number of species collected by this method in Missouri. One species, Strangalia sexnotata, is documented from fermenting bait for the first time in this study. 2015 fermenting bait trap catch, box 1 of 3 (click to enlarge). 2015 fermenting bait trap catch, box 2 of 3 (click to enlarge). 2015 fermenting bait trap catch, box 3 of 3 (click to enlarge). * Not previously reported at fermenting baits in Missouri. ** Not previously reported from fermenting baits anywhere. With regards to other insects, no attempt was made to quantify their occurrence or diversity, but a few interesting specimens were collected. Elateridae (click beetles) and other beetles were notable by their absence, in contrast to the great diversity recorded from by Champlain & Knull (1932). Flower scarabs were the exception, with two Euphoria inda and a moderate series of E. sepulchralis taken only in red wine traps. The most common non-beetle insects encountered were moths, flies, and stinging wasps, for which molasses/beer seemed to be much more attractive than red wine. The majority of the wasps were Vespidae, but a few large Crabronidae (one Sphecius speciosus and two Stizus brevipennis, I think) and at least two species of Pompiliidae were collected (see box 3 image above). 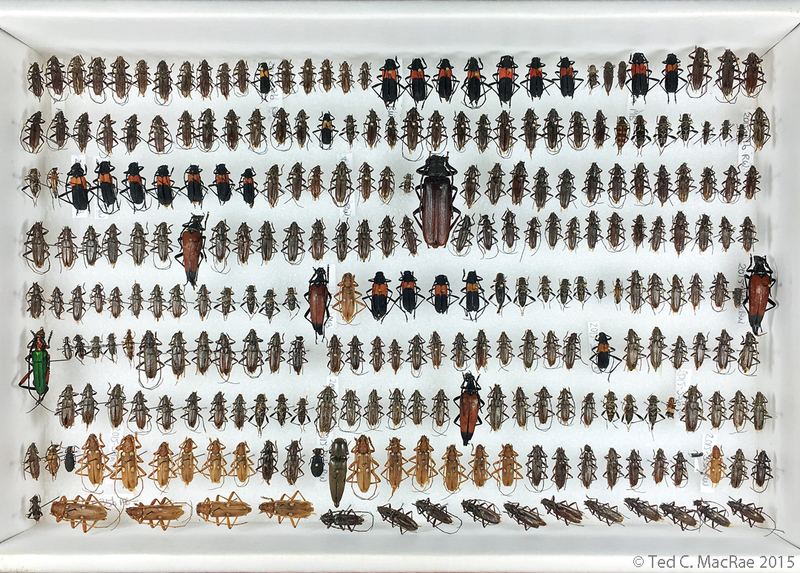 The diversity of longhorned beetles collected this season was undoubtedly influenced by habitat selection for trap placement (interface between dry, post-oak woodland and dolomite glade). Different habitats would likely yield different species, although prior experience seems to suggest that traps placed in open woodlands are more productive than those placed in dense forests. Recently thinned forests may have good potential due to an abundance of dead wood from thinning operations and trees stressed by sudden exposure to sunlight. Plans are currently underway to place traps (both molasses/beer and red wine) in a variety of wooded habitats during the 2016 season. This entry was posted in Cerambycidae, Coleoptera, Disteniidae and tagged Beetle Collecting 101, beetles, entomology, insect collection, insects, longhorned beetles, Missouri, nature, science, techniques. Bookmark the permalink. I want to try in the next year a trap with wine and sugar and yeast. I tried it only once and I got Protaetia (Liocola) lugubris, 4 specimens after 6 days of mostly cloudy and shower rains weather. I didn’t know this species exists in that area before mounted the trap. Any comments on how to keep bears out of the traps? I’ve never dealt with this problem. I’ve been placing photos of Stephen Colbert on each trap…. Actually, I place the traps as high as I can, say 15 feet off the ground or more. When I can’t hang the traps so high, I set out many smaller traps in hopes that the bear(s) won’t find them all. Very timely, Ted. Our field station has a lot of Ash, and EAB got there in noticeable numbers this year. We’ll have a lot of dead trees for a few years and I want to try this technique. I don’t think Agrilus may be attracted by this trap. Only if they fall in accidentally, like in a bucket of water hanged in the tree. You have to try pheromonal traps for Agrilus, or glued traps. The EAB is not present here, but we have about 35 species of Agrilus, most of them develop in trees, very few on bushes or herbs, I am studying the diurnal behavior of the Agrilus species which develop in oaks. I think Dave wants to use this method for sampling the anticipated high populations of longhorned beetles in the area because of high ash mortality. Good luck with that. Many species of longhorned beetles are known to utilize dead ash. Great post, Ted! Looking forward to trying my luck with fermenting traps this summer wherever I end up. That is impressive. The only cerambycid I have seen come to my underwing bait on tree trunks has been Megacyllene robinae. Henry Howden told me he once filed a travel claim for an official trip on which he set out fermenting bait traps. He charged for a case of beer. Auditor told him beer was not an acceptable expense do he resubmitted the claim asking to be reimbursed for 24 bottles of bertle bait!! Apparently the auditor had no problem with that. Some good Clerids in there. Keep meaning to try this in the Jersey pine barrens. Maybe this will be the kick I need. I am working at fermented bait but I want to get some pdf of original articles to write my own article. Everybody great thanks who helps me find original pdf. Glad this was helpful to you. good mix; apple and bana mixed in bleder, sugar, salt, yeast and you have 20 Cetoniidae specimens, lugubris, aurata, metallica, fieberi, wheather is not good. As far as I know, longhorned beetles associated with gymnosperms are not attracted to fermenting baits, so unless there is a good deciduous flora in the pine barrens it might not be worth the effort. There are lots of oaks in the barrens. Maybe more oaks than pines. But that is good to know. If you have any nearby riparian corridors you might actually have some good results. Hi! I want to ask about 1 thing – Do you use any ethylene glycol to protect the insects against mold, which fell into the trap or you systematically check the trap? If u didn’t use ethylene glicol what you think about using it (maybe it’s a bad idea)? I wanted to use ethylene glycol in Barber traps, but I was warned it induces “rigor mortis” to the insects, exactly like the ethylic alcohol, this makes impossible a good preparation of the beetles for collection and especially for photographing. So give it a try first. I have used white wine + sugar + yeast and I was collecting Protaetia marmorata. If you check the trap once at 10 days at 20 degrees Celcius this is good, but reduce the period when the temperature raises. I notice that the beetles can sometimes become too soft and fall apart if they remain in the trap longer than one week, so I just make sure to check them once each week. I’m not sure how effective it would be if you need to go longer than a week because of the dilution effect by the bait, and I wonder if the ethylene glycol could somehow reduce the attractiveness of the bait. One would need to test it in the field to see. I have used ethylene glycol in pitfall traps as a killing agent and preservative and it works fine. I did not experience stiffening of the specimens to the degree that they were too difficult to mount properly. Well, FRI 8/5 I placed 6 traps in a south Texas StPk. I know it’s not the ideal time of year, but fingers crossed! I hope that worked out and will be anxious to see any material you wish to send for ID! Probably a lot of elaphidiines (though some could be very good – in west Texas I trapped a series of Elaphidionopsis fasciatipennis Linsley & Chemsak! ), but if you find the right spot you might get some nice species. Certainly Plinthocoelium schwarzi should be attracted to these traps and maybe Callona rimosa also. So far not much to brag, but it’s been that sort of in-between season. Keeping some traps up this winter just in case…but really waiting more for Spring for specimen boons. I have not yet caught any of the species you just mentioned in the traps, more seemingly common species so far. Well, common species in your area can be very interesting to a Missouri entomologist! They were to me, too, having never caught them before. We should touch base when I leave Texas (hopefully in the next several months). At that point, I’ll have all I’m going to get. I keep every ‘bycid. I did five 1 gallon milk jugs with 1 pt molasses 1 pt beer and 20 pt water, suspended about five feet high along a,treeline that runs parallel to a riparian corridor in n tx in late august/early sept this year and didnt get a single beetle species of any kind. (I did get a few paper wasps and moths) any idea why such dismal.failure? P. suaveolens is fairly common at the site, although I know it was a little late in the year for them. But seriously nothing? This was my first attempt at beetle baiting so if anyone could show me the error of my ways I would appreciate it. I want to bait for scwartzi in the rio Grande valley next June but not unless I can get some better results. Thanx! Hi Clint – I suspect that your bait is too dilute (1:1:20 is mostly water!). I’d try again this coming summer but place your traps by late May and try a much more concentrated solution (see my instructions above, works out to about 1:1:2). Plinthocoelium may have been out that late, although here in Missouri they are most active from early July and decline by late August/early September, but the dilute bait was probably ineffective at attracting them. Yeah, that’s too diluted as Ted noted. Also, I started in the lower RGV in August catching some nice series of common species, but no Plinthoceolium…I guess I was too late to the party this year. We have Batocera rufomaculata problem in durian crop. Can you propose any mixture for them? I’m not sure if you want to know how to collect them or control them, but either way I don’t have any information.